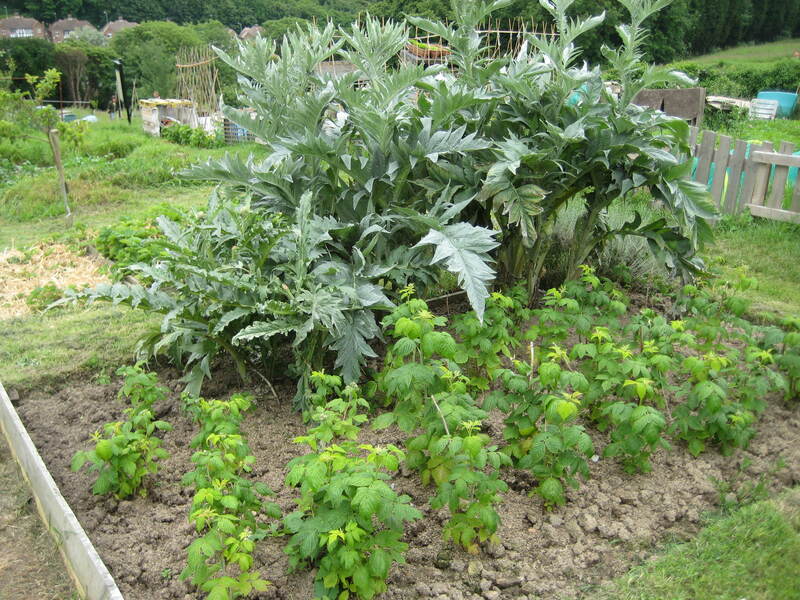 Raspberry bushes, cardoons and globe artichokes growing at Fernbank Allotment. Five years ago on June 16 the Grumpy Vegan returned to England to live from the USA accompanied by one cat, Emmy, 11 suitcases, various other luggage and one human. S’Funny. The five years have gone quickly but it doesn’t seem like it when you live each day. Oh well. Time plays tricks as you get older. One project we wanted to establish on our return is an allotment. In the USA these are known as community gardens. Basically, you rent from the local council a plot of land alongside others for a nominal to grow fruits and vegetables for your own consumption. 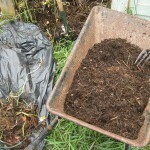 We started composting as soon as we had the allotment but this is the first year we used our own compost. 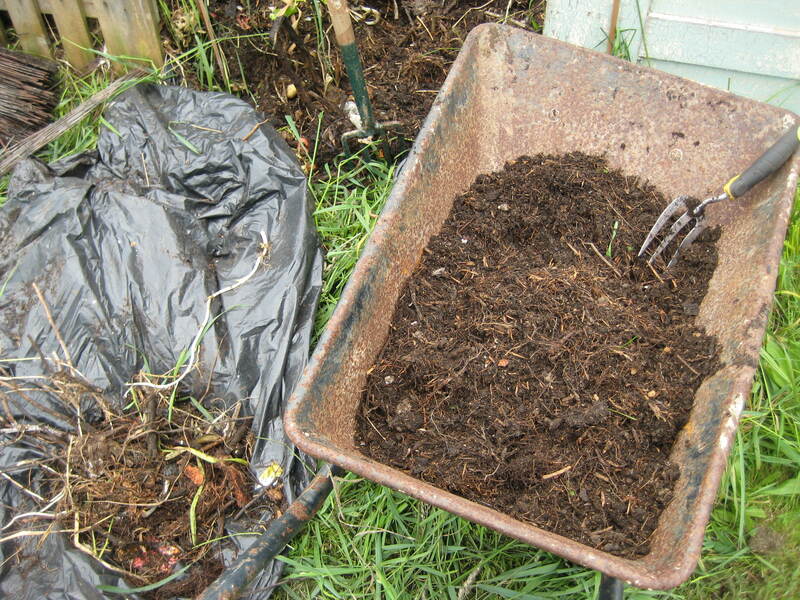 I hand fork the compost in the wheel barrow to remove large twigs and other unwanted stuff. We put the compost around the fruit trees. 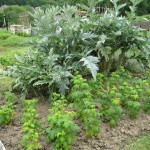 I’ve written before here about the our allotment at Fernbank. 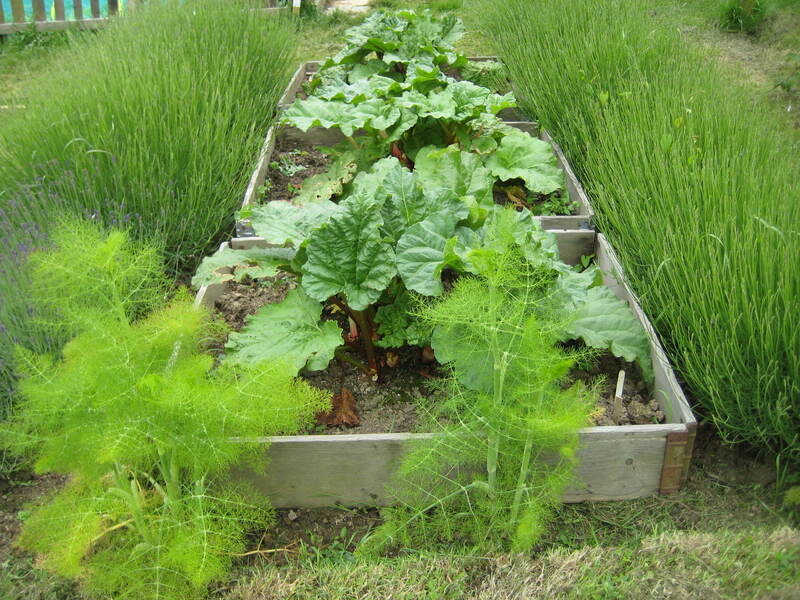 (Click on the tag Fernbank Allotment Hastings to find them.) But I haven’t written about the allotment for a while. Anyway, notwithstanding the most miserable of weather imaginable over the last few months, progress is being made at the allotment. In fact, it feels, at last, as if all our labour and resources which we’ve ploughed (literally) into the project are beginning to pay off. None of this wouldn’t have been accomplished without the help of two of our lovely neighbours and friends, Gina and Kate. Our most successful crop to date has been strawberries. So, we expanded the area in which we grow them. We moved the rhubarb to a new location during the winter and it is thriving now. Too early to pick strawberries but we’ve cropped rhubarb twice so far. Our plot is on the side of the West Hill, which separates Hastings from the Old Town, but quite aways away from the castle which is at the end of the cliffs by the sea. We have great views across the valley in which the Old Town sits and out to sea. But it also means we’re attempting to grow produce on the side of hill which is exposed almost constantly from winds off the sea. This is one reason why we like to grow cardoons and globe artichokes, as they make attractive windbreaks. We’re also growing fruit trees (three apples, two pears and one plum, if I’m remembering this correctly) which are fruiting but not quite ready to eat but will be pruned to help act as wind bafflers. 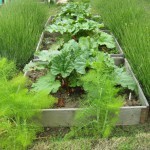 This entry was posted in The Grumpy Vegan Life and tagged Fernbank Allotment Hastings. Bookmark the permalink.